A big day on Philippine television. No, not just the premiere of Willie Revillame’s Willing Willie, but the signaling that yes, there are more than two networks in the Philippines. And just like that, what was arguably one of the most successful, most popular, and certainly controversial Philippine programs ever is over. ABS-CBN put the final nail in the coffin today on Wowowee (2005-2010 – Rest in Peace), the noontime variety show that not only brought hope and joy to the people of the Philippines six days a week at lunchtime, but engaged audiences around the world, Filipinos and non-Filipinos alike. ABS-CBN may not care all that much for the show these days, but the public still do (the show wins the nationwide ratings) and TFC subscribers abroad make a point to book seats for the show when they return home. And it’s moments like these that prove just how amazing Wowowee can be. At least 73 people have been confirmed dead after a stampede turned a what was supposed to be joyous day into a tragic one. Anywhere from 300 to 500 injured people were brought to area hospitals. Over 30,000 people gathered at the Philsports Arena (formerly ULTRA Arena) in Pasig City, Philippines to attend the 1st Anniversary celebration of ABS-CBN’s “Wowowee” in the hopes of winning one of several prizes. While the arena can only seat 13,000 people, the show promised raffle tickets to the thousands of people both inside and outside the arena. The raffle winners could win at least P10,000. But it were the big prizes that motivated thousands of Filipinos to Pasig City. Several hundred people would have been given the chance to participate in the actual “Wowowee” program in the hopes of winning either P2 Million, a taxi, a passenger jeepney, or a house and lot. The stampede occurred just before 7:00AM, Saturday when the tens of thousands of people waiting outside the arena began pushing and shoving their way to the gates once they were aware that raffle tickets would be handed out. Reportedly, ABS-CBN and ULTRA security personnel closed the gates to slow down the flow of people into the arena. However, this caused people to be pushed against the gate while the crowd of people continued to push forward. The downward slope of the hill towards the entrance of the arena only increased the intensity of the flow of people as they ran down towards the gates, which later collapsed under the force of people. That is when people began being buried under the crowd. It took almost two hours until emergency crews were able to make their way through the tightly packed crowd to the injured and dead close to the gates. In a broadcast which was shown on ABS-CBN and its international channel TFC, a visibly shaken Willie Revillame, host of “Wowowee,” spoke to the people while fighting back tears. He first expressed his deep sorrow at the tragedy and asked for understanding that the show would not go on. This prompted the filled ULTRA arena to chant “Wala kang kasalanan!” (“You are not at fault!”). Revillame was joined by Vice President Noli de Castro and ABS-CBN Entertainment Vice President Charo Santos-Concio who both asked for prayers for the families of the victims. Santos-Concio promised that ABS-CBN would do everything in their power to help the victims. At the end of their messages, the arena erupted in a chant of “Wowowee” in a show of support for the show and its hosts. de Castro was the first government official to make their way to ULTRA arena, and helped oversee the transport of victims to local area hospitals. Meanwhile, President Gloria Macapagal Arroyo ordered a full inquiry to the incident and wanted results within 72 hours. Later Saturday afternoon, Arroyo visited the victims in the hospitals. Willie Revillame told ABS-CBN News that he would take leave for the next week to meet with the families of the victims and promised that “Wowowee” will continue to help the needy of the Philippines. As of now, the show will air on Monday, without host Revillame. 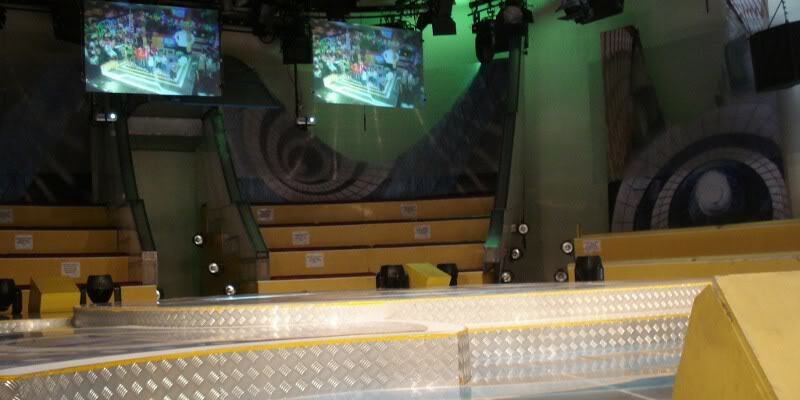 “Wowowee” has become an popular tourist attraction for overseas Filipinos, while the impoverished Filipinos in the Philippines hoped to be a part of the show. The program gives prizes of up to P1 Million (equivalent to $20,000). Even the smallest prizes of P1000 are the biggest of help to the Filipino people, most of whom live at or close to poverty levels.